The portal is your hub to manage templates, data source excerpt files and to manage your account. The portal can be found at https://portal.reporting.cloud. The portal gives you an overview of your recent activities, the service status and your usage quota. 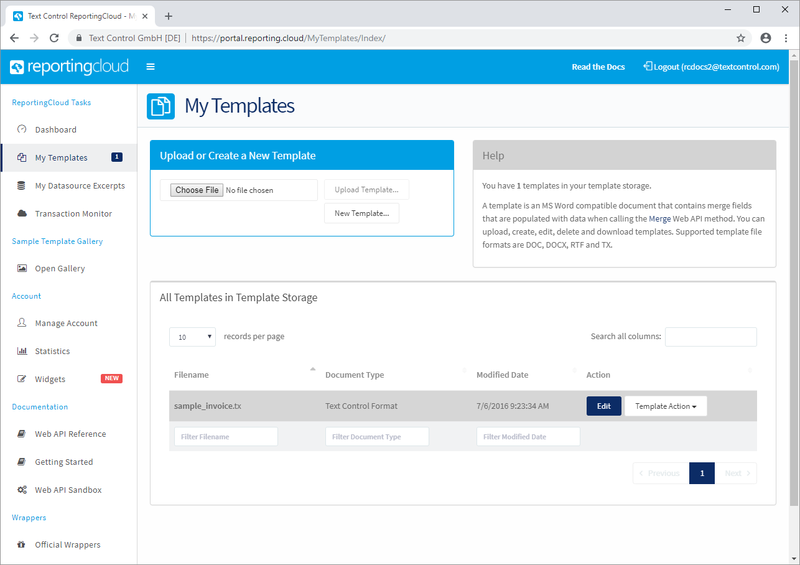 ReportingCloud allows you to upload templates to the template storage. The major advantage to create documents from templates that are stored in the template storage is performance. 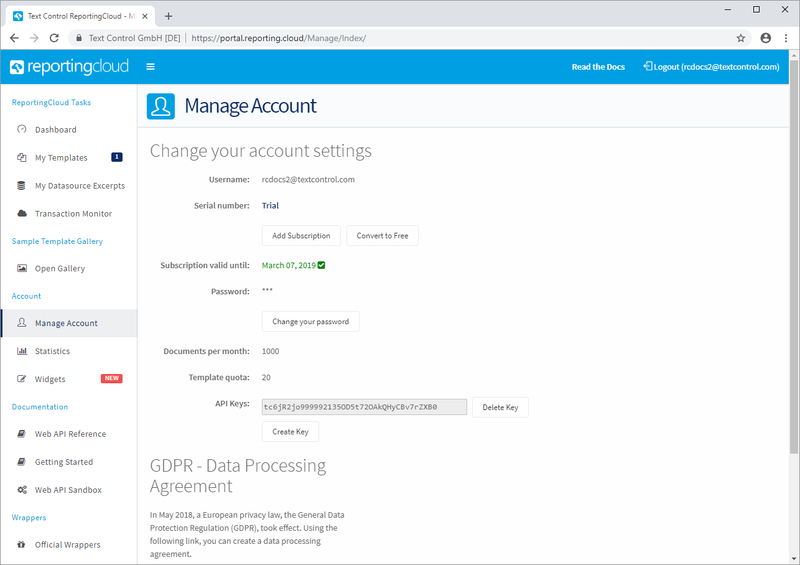 Instead of sending the document with your request, the template is loaded from the ReportingCloud template storage which saves bandwidth and therefore request time. The portal allows you to create templates using a full-featured template editor. Simply click on Edit in the list of templates which brings you to a template overview. Here, you can choose your data source excerpt file and click Edit Template to open the editor. 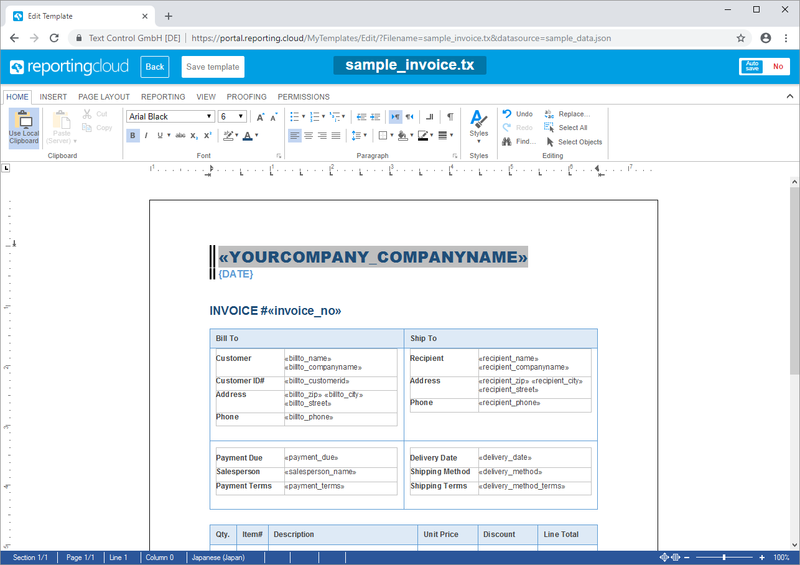 The editor provides an MS Word look and feel interface and enables you to create your templates like any other MS Word document. 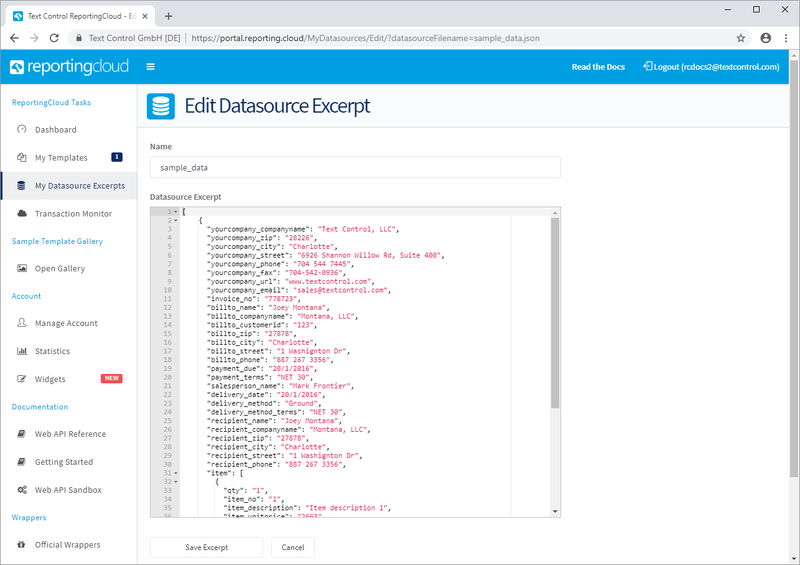 A datasource excerpt file is used to fill the drop-down lists of the template editor with proper merge fields, relations and dummy data for a template preview. A datasource excerpt file is not your actual data that is used to merge your template. It helps you to design your templates and to insert the proper field names. 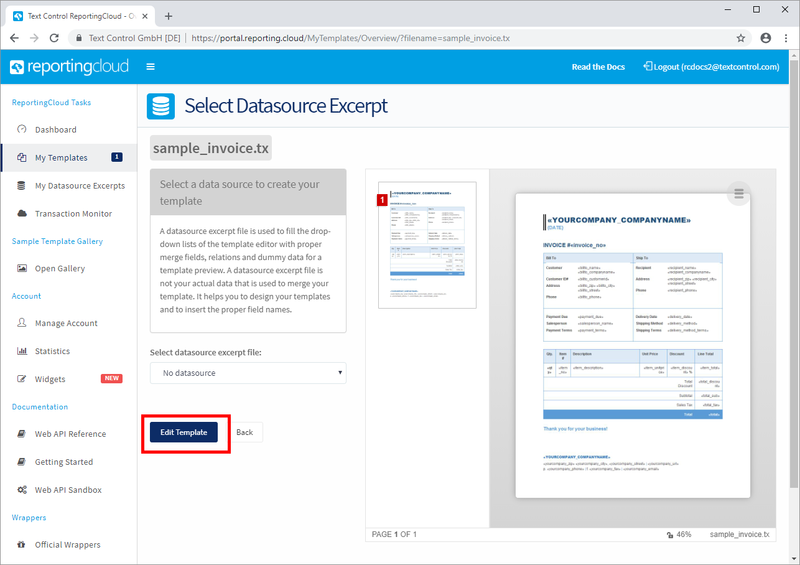 The format of the datasource excerpt file is the same as the accepted datasource of the Merge Web API method. It is a JSON string containing an array of objects. 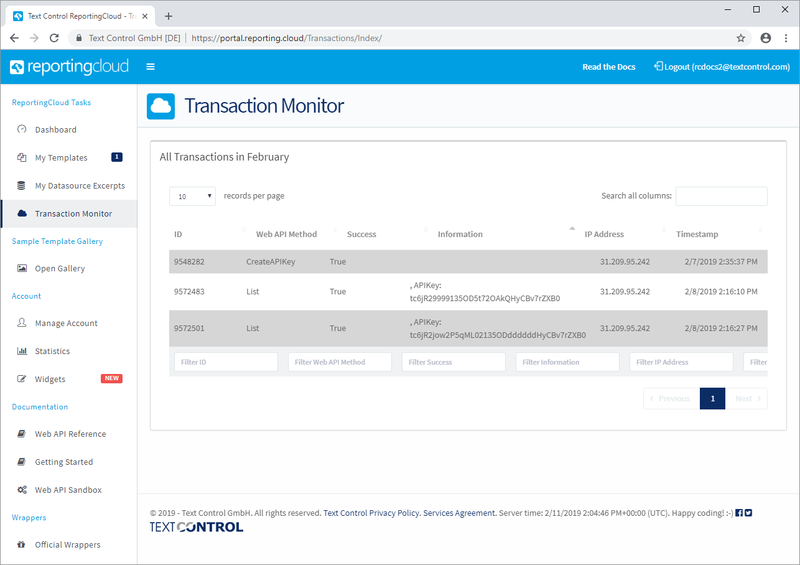 The transaction monitor shows all transactions in the current month. You can sort by and search for used methods, information such as API Keys or time stamps. 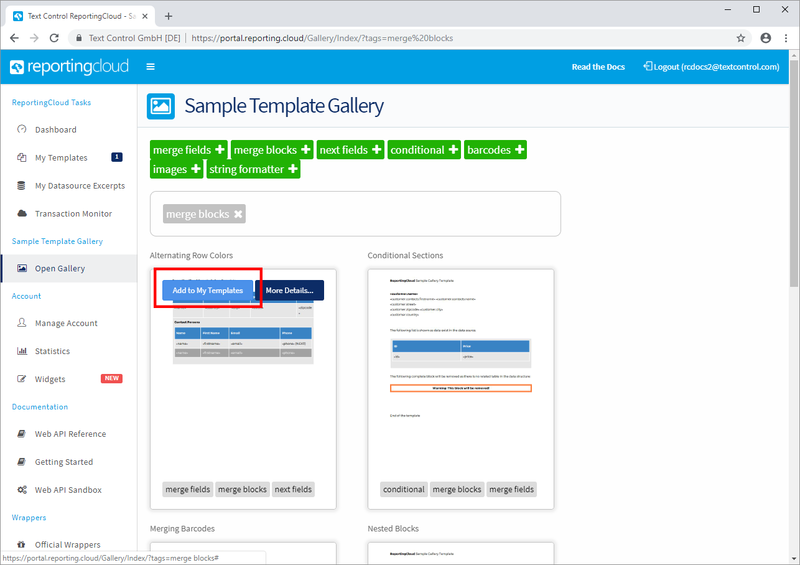 The sample template gallery provides sample templates that can be easily copied into your template storage. Simply select one more keywords such as merge fields, hover the template preview and select Add to My Templates. The template is then available in your template storage and can merged or modified using the online template editor. In this section, you can add a subscription to your account or you can convert your trial account to a free account. Additionally, you can see your current quota settings and you can manage your API Keys. 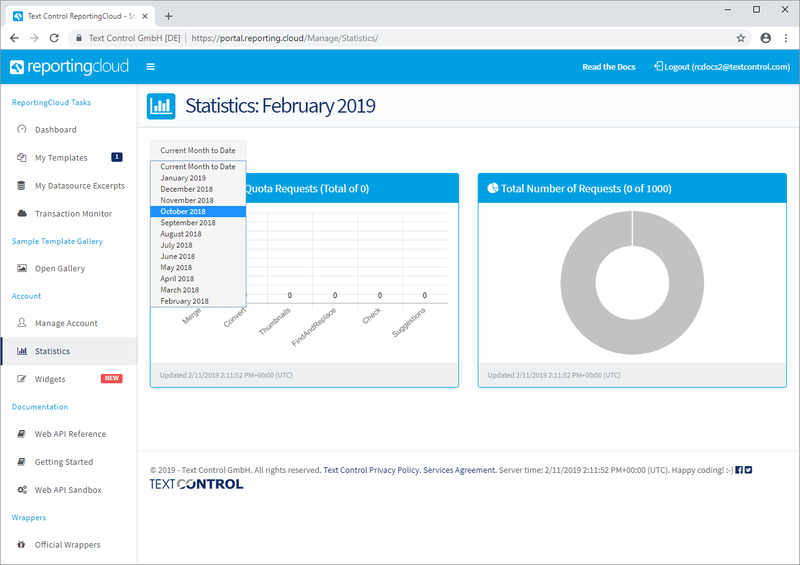 The section Statistics gives an overview of your monthly quota usage. The option Current Month to Date shows the usage in the current month. Additionally, you can choose any month in your history to retrieve a report of your monthly ReportingCloud usage.